Will Emily dare to help the new girl in the kindergarten, especially when others aren't? Charlotte is a new girl in the kindergarten. She has unusual appearance: coppery curls, big wide open eyes, and funny freckles. The other children aren't sure what to make of her and are not very friendly. Ben is a pugnacious, mischievous boy. Â He has a bright jumping toy that accidentally hits right into Charlotte's hands & then breaks! Charlotte knows she didn't break it. But Ben is sure that it is her fault and, clenching his fists, he goes to Charlotte! Emily is a sweet and very kind girl. Will she be able to help Charlotte, how to dare to be brave and resist the offender? Cute kids poem in bright and beautiful illustrations teaches your children kindness and how to dare to be kind. It would be a wonderful Christmas gift for your child! 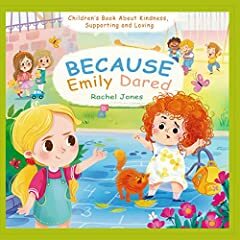 From childrenâ€™s author Rachel Jones, this gentle story shows how to respond when a friend needs help.Â Rachel provides examples of kindness - helping, paying attention, supportingÂ and confirm that it is not always easy to be kind, particularly when others aren't.Â And colorful illustrations help aÂ child better represent the whole storyÂ and tell itÂ in hisÂ own way. Enjoy this book by clicking the BUY NOWÂ button at the top of this page!